You’ve heard me mention before that me and my cousin has a very nerdy spreadsheet that contains all the restaurants we see on other blogs or are recommend to us, so that we can work through all this delicious places without forgetting any of them. Before our amazing chocolate making at Paul.A.Young last year, we managed to tick a restaurant off our list. 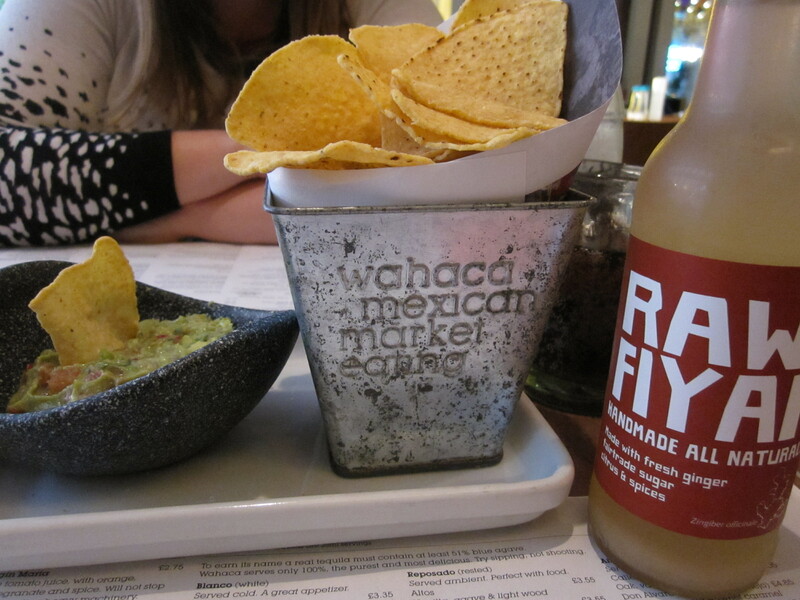 Wahaca, was set up a couple of years ago by Masterchef winner Thomasina Miers, with the aim to stay clear of the terrible Mexican style food that was currently available in the UK, with more authentic street food style Mexican cooking. And if by luck we arrived on Mexican Day of The Dead celebrations! Hurrah! 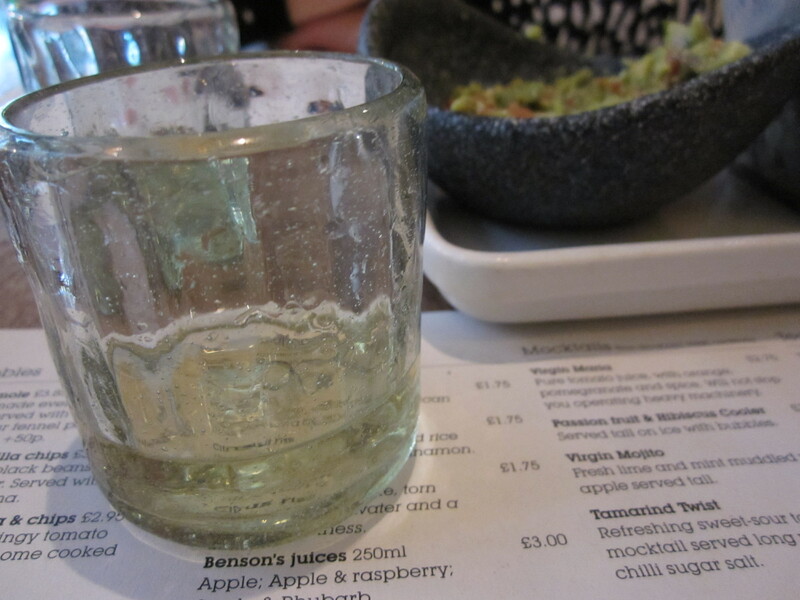 I did mention to the waiter if it hadn’t just turned twelve o’clock I would be totally all over the tequila menu. Tequila is my go to drink I love it. Not as a shooter, oh no. A long drink, a sipping drink, you name it and I love it. Well, the kind gentleman waiter informed us that as a part of their Day of The Dead celebration, he could offer us a FREE tequila. Say What?!?!? If you are ever asked this question, the only right answer is HELL YA! We had a measure of multi-award winning El Tesoro de Don Philipe. But was asked to not shot it but sip. It was smooth as water with a slight fiery kick to wake your senses. Sipped with the spicy food was a dream. Truly converted. The set up of the menu, is perfect for the greedy cousins. 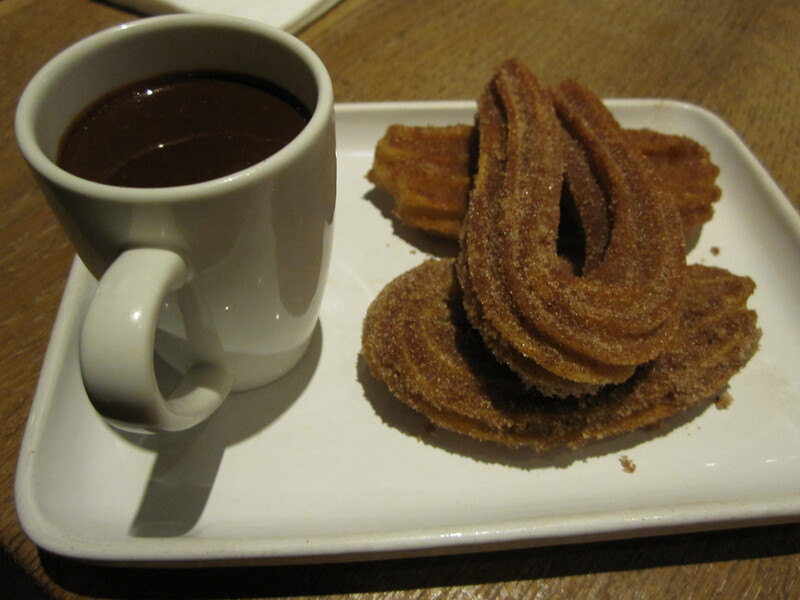 With the Street Food menu, we could order lots of little plates to try plenty of the different treats on offer. We may of gotten quite a few for the two of us, but you know what, I have no regrets and would do it all over again! 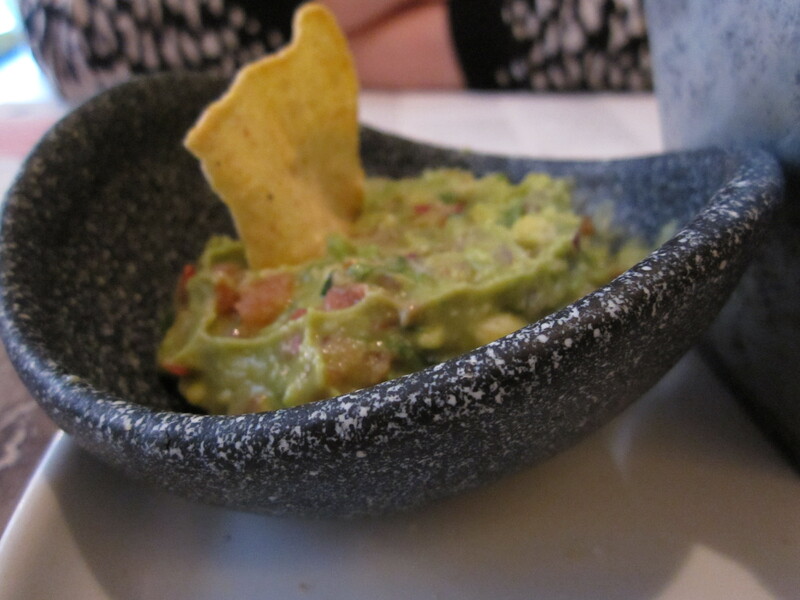 We started with the classic Guacamole which is made fresh each day in their kitchens, so no browning gloop here. Fresh, vibrant and creamy. Paired with the salty corn tortilla chips (with the option to dunk fennel pork scratchings in it too, which I am totally doing next time), got us in the foodie mood to order our other nibbles. The plates came out at different times which was great as we had forgotten what we had ordered so the constant stream of food seemed never ending. 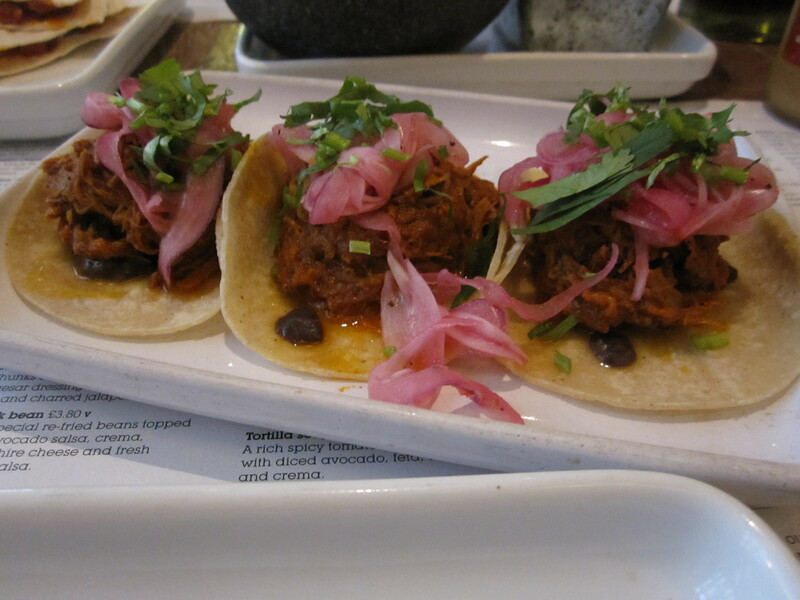 First up was the Pork Pibil Taco’s. 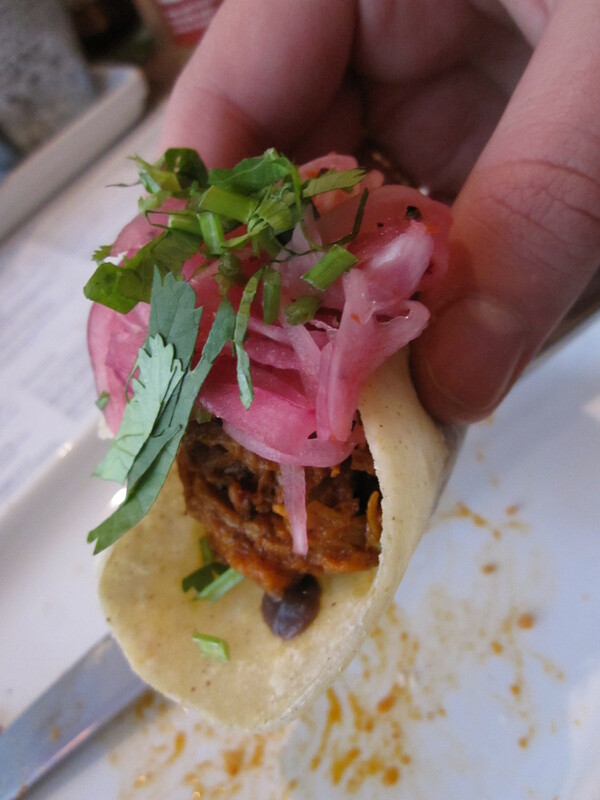 ‘Slow cooked pork in Wahaca’s special Yucatecan marinade with fiery pickled onions.’ Juicy, tender pulled pork that will have you licking your fingers with the spicy juice dribbles down them. The pickled onions weren’t harsh against the meaty pork but complimented it beautifully. It was nice trying traditional soft tacos rather than the hard as anything corn taco shells we used to get in a meal kit. Class. 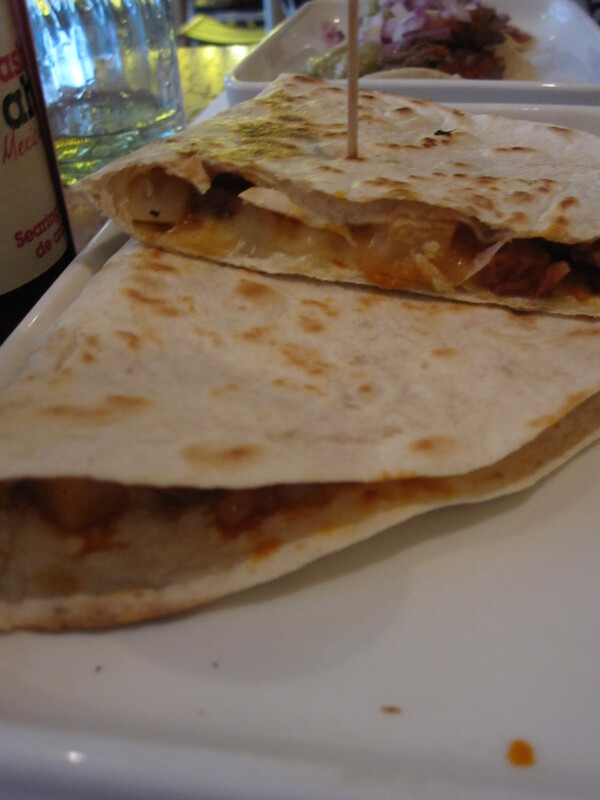 Chorizo & Potato Quesadillas, ‘British chorizo, made to Wahaca’s own special recipe, fresh thyme and steamed potato.’ I can’t say I was truly blown away with these cheesy, meaty quesadillas. I think if everything else wasn’t so delicious it would be really tasty but the potato slightly wash out the impact of the flavoursome chorizo. They still got polished off though…. MORE TACOS!! This time, Grilled British Steak with Chipotle Salsa. These were stand out for me. The smoke from the grilled steak and chipotle was a knock out. 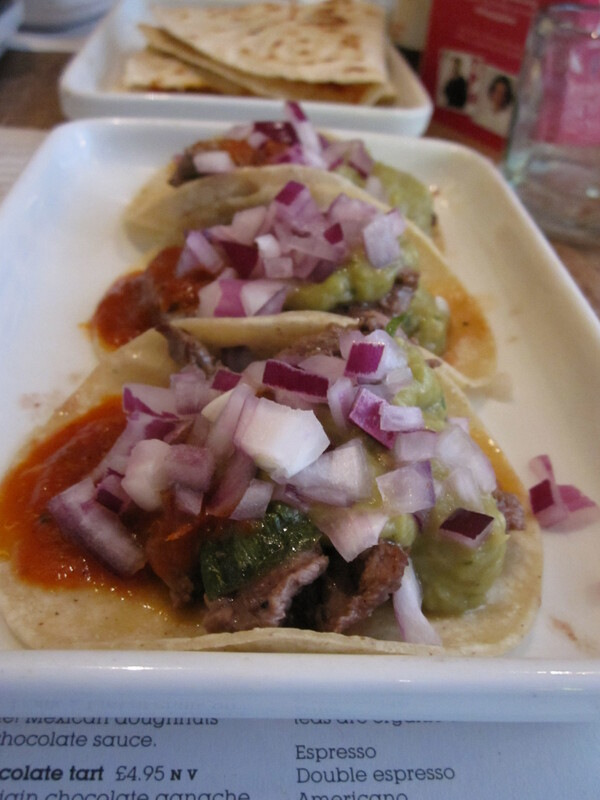 The steak was cooked perfectly, just melted away with the tang of onion and creamy guacamole. Bring on another round of those beefy beauties. 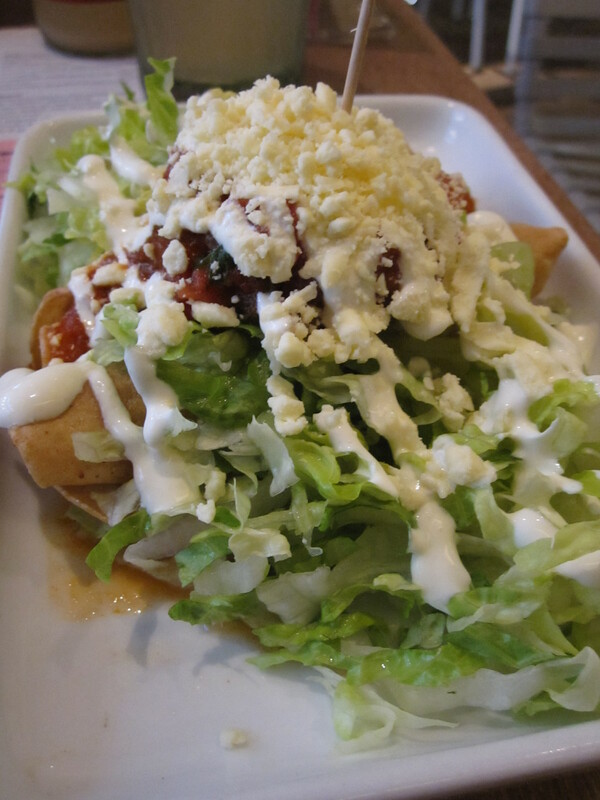 ‘Taquitos with marinated chicken, shredded lettuce, Lancashire cheese and fresh tomato salsa.’ Lancashire cheese?? In a Mexican restaurant? These little fried cigars of succulent chicken works oh so well with the salty crumbly slightly drier than feta cheese. Again a great dish that I was sad to see it was all gone. Lastly, was one of the specials and oh boy was it special. 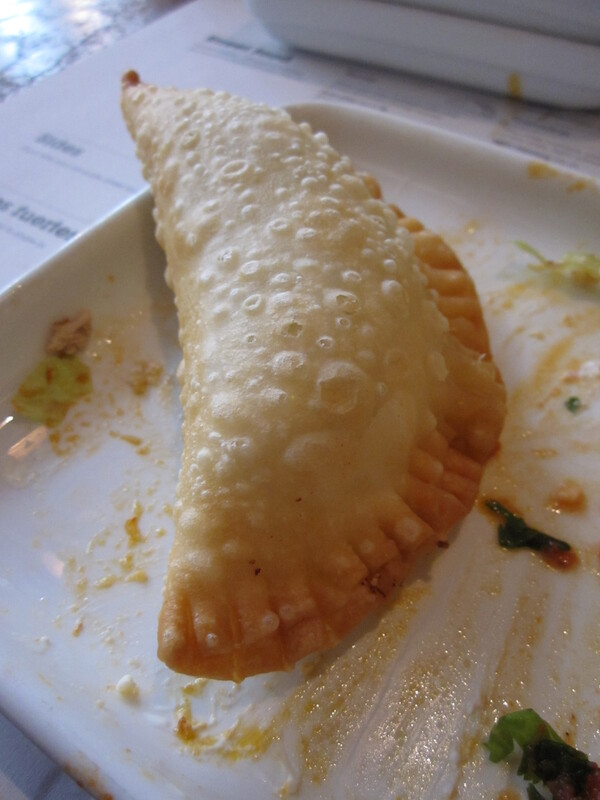 Queso Blanco Cheese Empanadas. Crispy shells with oozy, stringy cheese delight. We were in love. I know you shouldn’t but I love fried food. The best fried food. 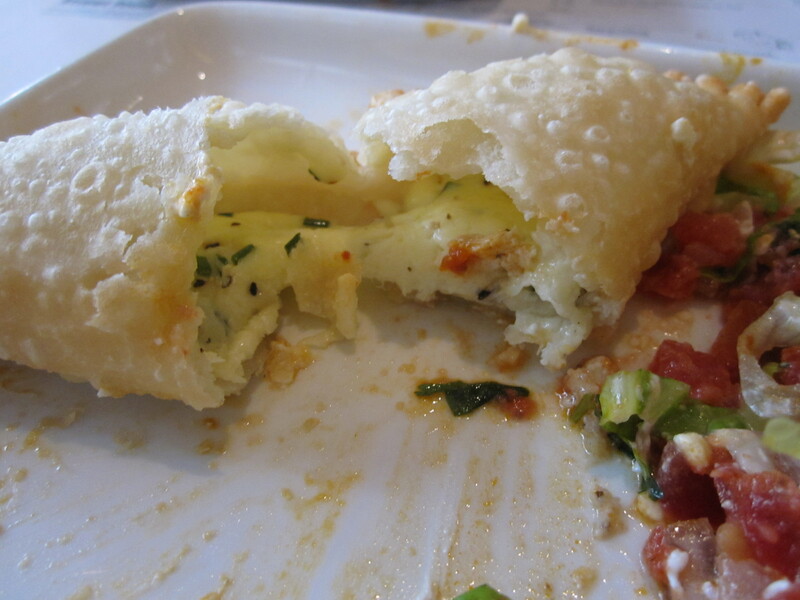 Fried pastry stuffed with cheese. That’s right. This was brilliant and hope it will make it on to their main main to stay. 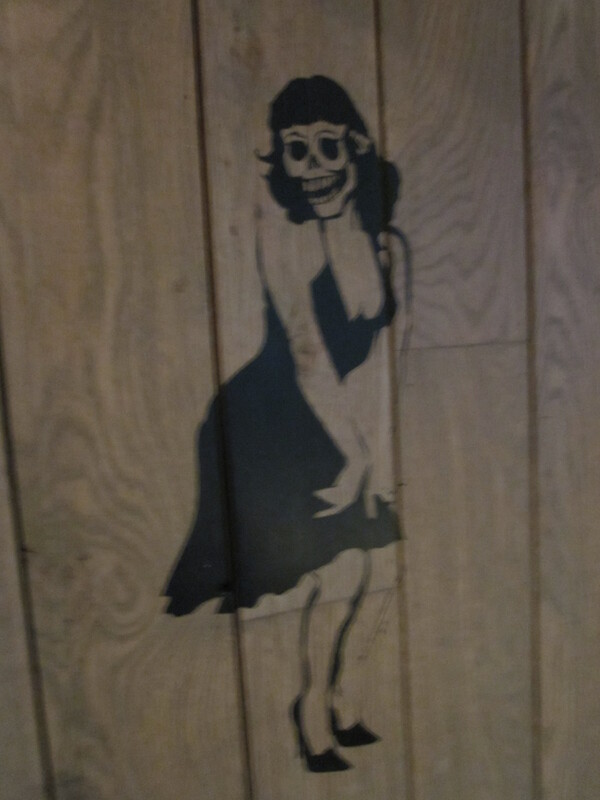 Awesome sign for the ladies toilet…. 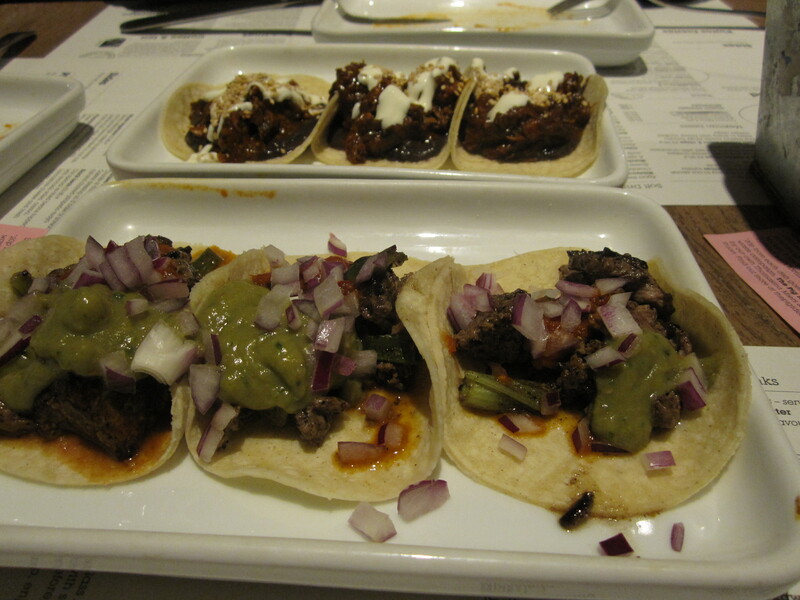 Me and my cousin enjoyed the menu so much that a couple of weeks later just before we went off to wine tasting, did we introduce her husband to the Wahaca joy. 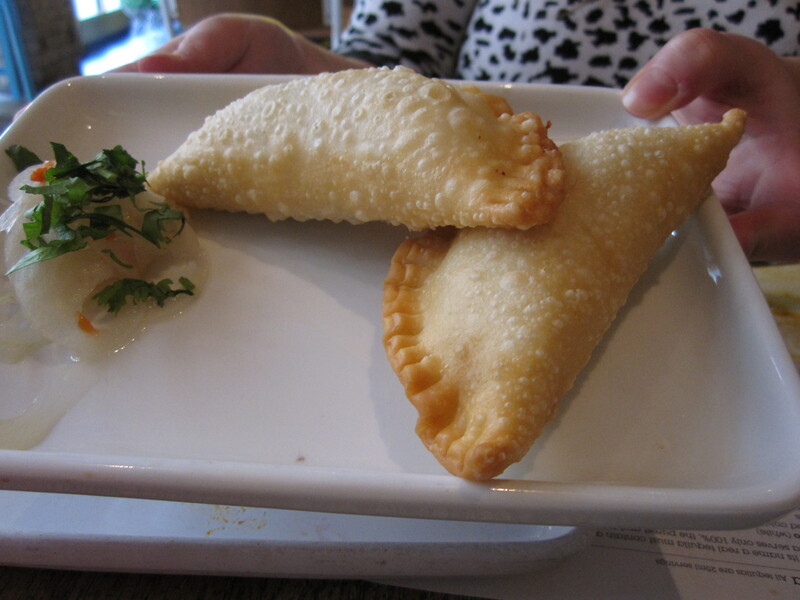 We ordered our favourites from above (lucky the empanadas were still on the menu so we got two portions of those.) We also tried a few more dishes as we had the excuse there was another person with us to feed. 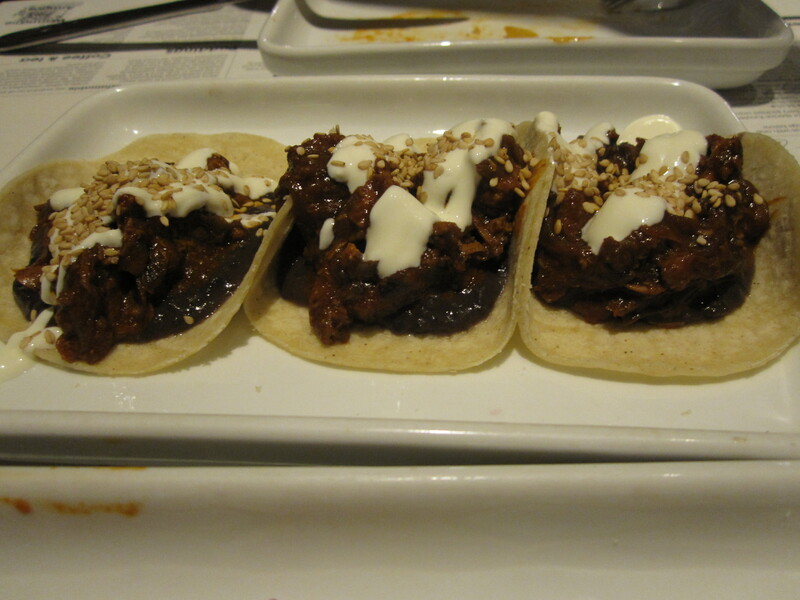 Chicken mole tacos, ‘Tender chicken in a rich red Coloradito mole sauce from Oaxaca.’ I had never tried a truly traditional mole sauce but have been wanting to try it out for ages. People tend to freak out when chocolate is present in savoury dishes but where else would you expect to see it in, food of the Aztec’s. A rich deep earthy sauce which just makes me want to jump on a plane and never leave Mexico. When we first visited we kind of over looked the side dishes. Which was a big mistake. 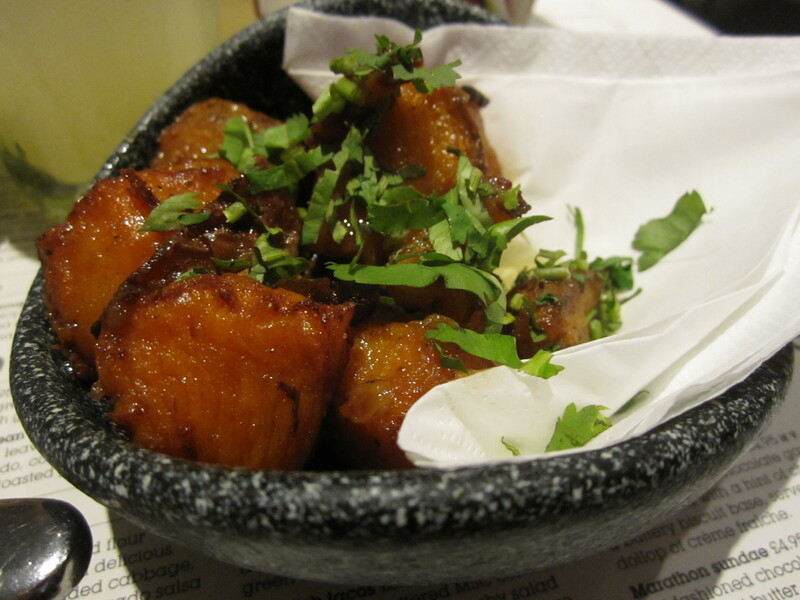 The crispy fried sweet potato dressed with smoky caramelised mojo de ajo. Will rock your world. Caramelised, sweet, smoky and not nearly enough. These should be on as a big plate dish as we could of easily eaten a mountain of them. Delicious. Chicken Caesar Tostadas came with ‘Chunks of chicken tossed in a creamy Caesar dressing on a base of shredded cos and charred jalapeño mayo.’ Nice dish, refreshing with a kick from the mayo. 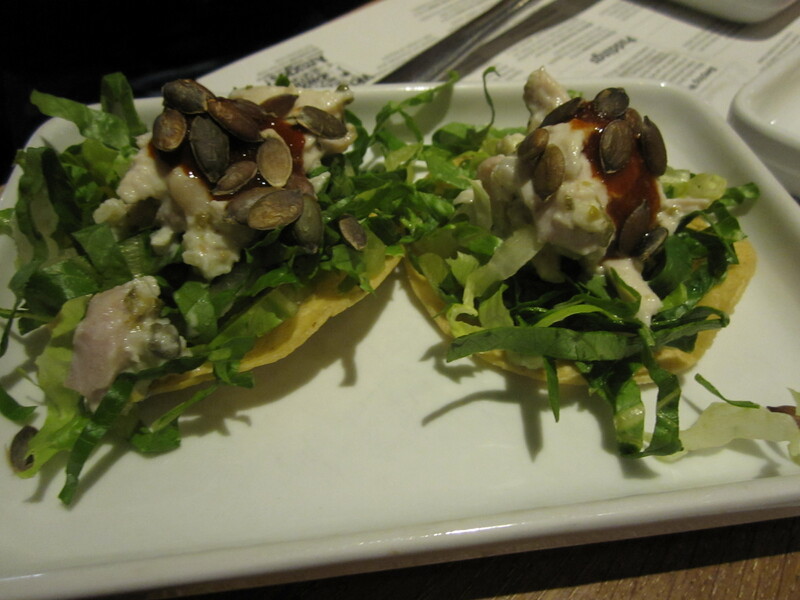 Interesting party game to split two tostadas between three of us. Napkins at the ready unless you are so much more coordinated and cooler than us, you will end with chocolate all over your chin and hands. And if you don’t then you aren’t eating them right. I now can’t wait to go back and tackle their burrito menu….